About 10 million gallons of water used to wash frac sand was drained in order to save a man who was trapped underwater in a bulldozer cab for more than two hours, according to officials with Hi-Crush Proppants. Just before 8 a.m. on Monday, first responders were called to the Whitehall frac sand mining facility after a bulldozer operated by Robbie Gunderson of Gerke Excavating became submerged in a holding pond. Hi-Crush CEO Scott Preston said rescuers, including a dive team, searched for the bulldozer in the pond for two and a half hours but were unable to find it. During that time, Gunderson was trapped inside the machine’s airtight cab and was able to communicate with rescuers by radio. In order to access the bulldozer, Preston said the decision was made to breach a retaining wall on the holding pond. "We wanted to be able to maintain that airtight compartment that he was operating in and knew that we needed to bring down the water level to be able to gain access to him," said Preston. The breach released about 10 million gallons of what the company calls process water, which Preston said contains mud, silt and sand and could contain trace amounts of a chemical called polyacrylamide, which is used to separate sediment from frac sand. The water and bright orange muck flowed through a coulee, flooding farm fields, covering a driveway and eventually finding its way into the Trempealeau River, turning it bright orange as well. Jeff Johnson, Hi-Crush director of environmental compliance and a former employee at the state Department of Natural Resources, said even if there are trace amounts of the chemical used to process sand, it isn't harmful. "We do use a flocculant from ChemTreat," said Johnson. "It's a very common flocculant used in many industries including wastewater treatment. So, nothing strange there. It's a nonhazardous substance and so we would expect potentially trace amounts of that if any in that pond water." Another concern is the possibility of naturally occurring trace metals being concentrated in the water like arsenic, aluminum and lead. 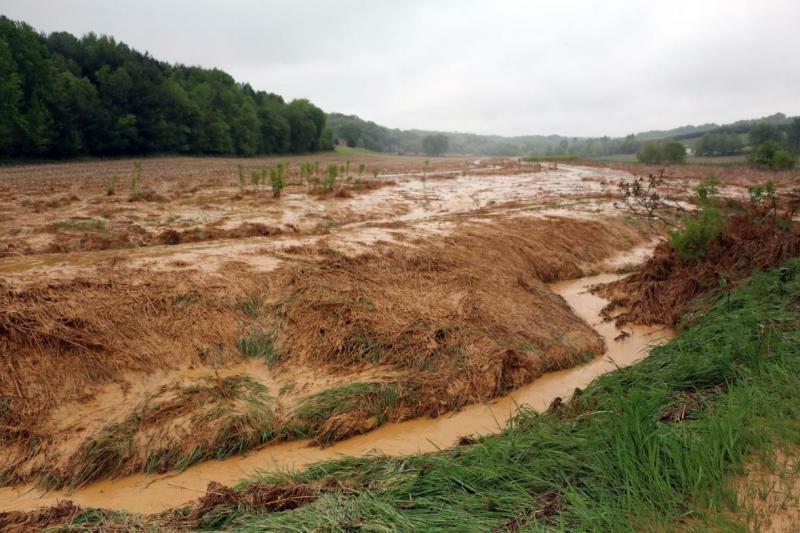 In 2016, DNR officials announced they would study groundwater around industrial sand mines after other holding ponds at mines around the state showed high levels of heavy metals. According to the agency’s website, that process is ongoing. Johnson said Hi-Crush has taken samples of sediment that left the Whitehall mine site and has submitted them for testing. He said results could be ready a week from now. Preston applauded first responders for a successful rescue and said the company is working with investigators from agencies including the DNR, U.S. Environmental Protection Agency, and the Mine Safety and Health Administration. "We will perform and are performing the necessary cleanup and restoration efforts," said Preston. "We’ve already started installing sediment runoff barriers to capture the silt. We've repaired the berm on the pond to prevent further drainage. We've started to clean up the neighboring properties that have gotten any of this material on their property and we will continue to work with the DNR on all cleanup efforts based upon their recommendations."